Let’s start by addressing the age-old saying “Don’t judge a book by its cover”. It’s time to admit that when it comes to books, most of us do actually judge them by their cover. That’s why we at Sweek consider this as one of the most important steps to publishing your own book. 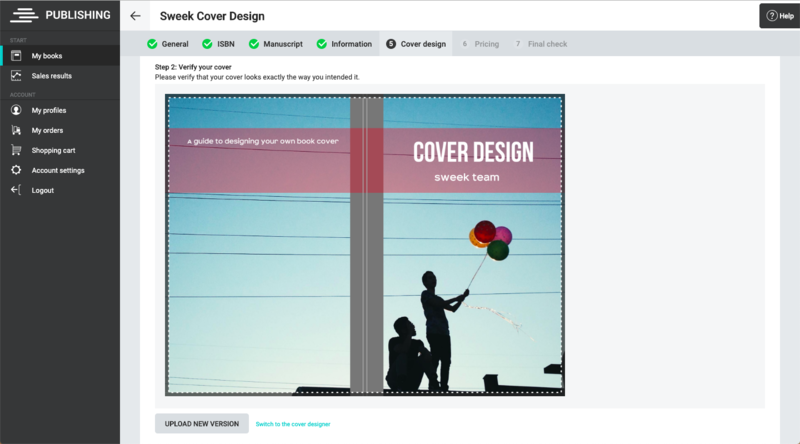 Read on to see how you can design your own book cover before you are ready to publish! Note: This guide is tailored to the Sweek Publishing process. If you want to know more about publishing your own book, we recommend checking out this blog post! 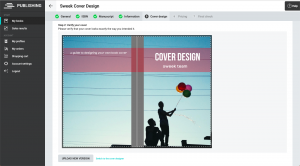 After you have uploaded your manuscript and provided information about your book, you have to upload the cover design for your book. 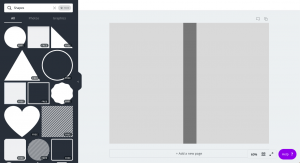 When you are on the cover design page, you can see how large your cover should be with regard to the number of pages and the size of the book. However, if you are not yet ready to start the publication process, you can easily make a calculation by clicking on this link: https://publish.sweek.com/site/index.php?r=covercalc/index. 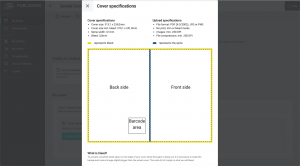 Also, make sure to check out the specifications (cover size incl. bleed in mm.) You have to upload a file that can be cut off by 3 mm and it is important to know the spine width as well! 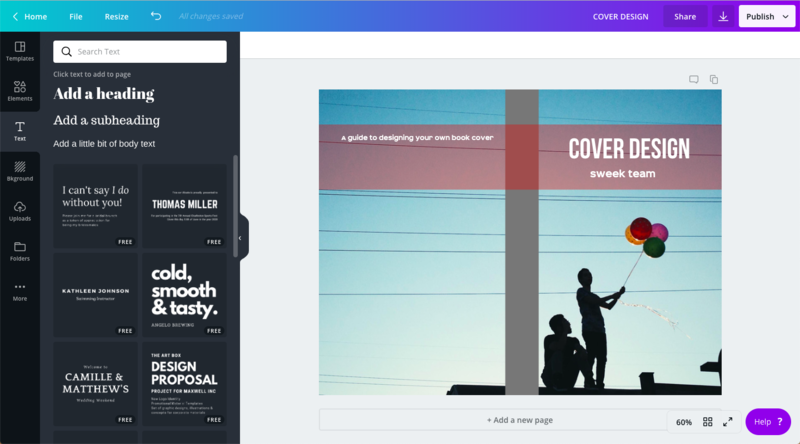 In order to design the cover, we recommend using www.canva.com. 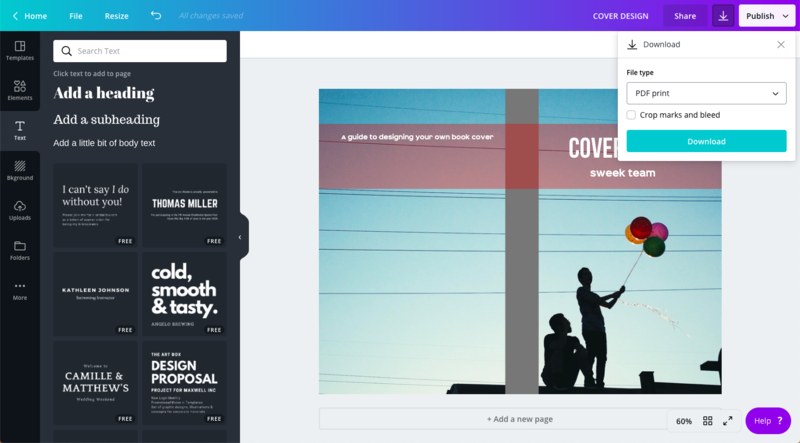 Once you have created a free account on Canva, Click on “Create a design” and then “Use custom Dimensions.” Select mm in the pop-up and then enter the format. Always add about 1 mm on both sides. So if it is 319.1 x 241.0mm, it becomes 320 x 242mm. This makes it more spacious and even if a small number of pages are added to your manuscript, your cover is still suitable. It’s time to start designing! In step 1 you have looked up the spine width in addition to the size of the cover. Add a plane (“Elements” and then click on the first square) and align it with the top and bottom. For the width, you can calculate your spine width in mm x 4.2 pixels. For example, 3.1 mm x 4.2 pixels = 13.2 pixels. 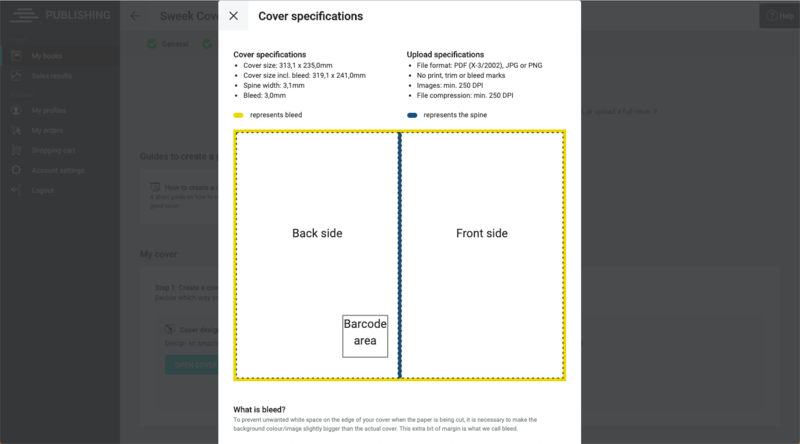 You can make the area smaller until it is 13 pixels wide, Canva just shows this next to the box. No worries, this all works very easily! Then drag the box to the middle, Canva automatically indicates when the box is exactly in the middle. Now you know which part will be the front (right side), the back (left side) and the back (dark grey area)! You will see “Uploads” in the left bar. Here you can upload your own image or search a free image of Canva by clicking on “search” and typing a relevant keyword. 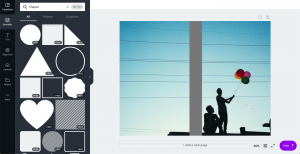 Alternatively, you can find pictures on https://unsplash.com/ that you can use for free. If you click on the image it will automatically appear on the cover. You can then move / mirror / align the photo. Click on “Elements” and then “Shapes” to add a surface, choose the colour, and if you wish, adjust the transparency. Of course, you can also choose not to use a text box and simply put the text on the image if it is legible. By clicking on “Text” in the right bar you can add the title, author name and flap text. You can also add a text on the back. Here too, you can drag, choose the colour, make text larger or smaller and adjust the font. We notice that a large text often looks better! Make sure you have room for the barcode on the back, bottom right. You’re almost done! Go to Download at the top right of the bar. Select “PDF – Print” for the best resolution and then click “Download”. 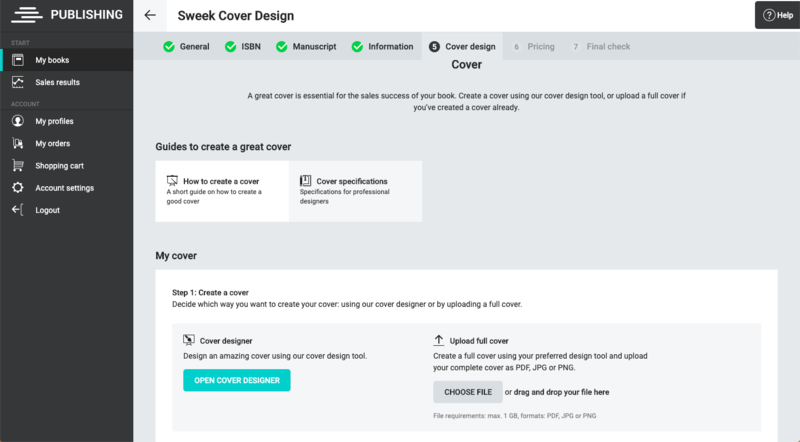 Finally, go to your book in Sweek Publishing and upload your design to check if everything fits well. Ensure that all the important information is still visible. There you go, you have successfully designed your own cover! Unfortunately, you do not have an editor when you self-publish. This means that you will have to proofread your entire book thoroughly before you publish. However, you can use this to your advantage because you have complete control over your work. Here are some tips that may come in handy when you want to proof-read your work! No one wants to read a book that has grammatical or punctuational errors. If you do not want to go over every word by yourself, we recommend using free tools like Grammarly that identify the errors for you and provide you with the correct usage. This may not always be accurate so don’t rely on it completely. The first stage can involve checking the spellings, followed by grammar and then punctuation, etc. Although this is very time-consuming, it helps to improve accuracy. People tend to read differently on screen and on paper. So if you print your manuscript and read it, you might be able to identify errors that you skipped while reading the online version. By reading the book out loud, you might hear something that your eyes missed out! Read it backwards: You’re probably confused now. Why should I read my book backwards you ask? It’s simple. When you’re reading it backwards, you are not focusing on the flow of the sentence or the content. This makes it easier to spot spelling mistakes. Sometimes, we tend to overuse certain words and phrases without even noticing. While reading it normally, out loud, or backwards, take notice of such words and phrases! Readers are quick to notice factual errors. If your book is fiction, this is not essential but it does affect your credibility. For non-fiction books, make sure to be accurate! If you keep reading the same words over and over again, you might not spot any mistakes. So, take a break, sleep on it, and get back to proofreading after a while. Alternatively or complementarily, you can have someone else proofread your work. Find someone who is willing to be your harshest critic. Friends and family want to see you succeed and would be willing to spot errors and provide suggestions. Proofreading does take a lot of time but you can indeed use the above-mentioned steps to make sure that it is less tedious. Once you are done with proofreading, you are ready to self-publish. Self-publishing is easier than ever with Sweek Publishing. 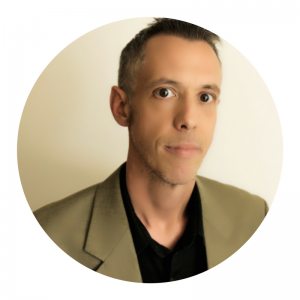 If you want to know more about how this works, check out this blog post. Have you always wanted to publish your own book? With Sweek Publishing, self-publishing your own book is easier than ever! Sweek Publishing is already live in the Netherlands, Germany, France, UK, and India. Very soon, we are going to go live in Brazil and Latin America. We can imagine the process of publishing your book seems daunting and time-consuming at first but don’t worry, we’ve got you covered. This blog post will inform you about everything you need to know when it comes to self-publishing with Sweek! As you’re responsible for the design and the marketing, this gives you a lot of freedom in self-publishing your book. There are also many other benefits that come with self-publishing, especially with Sweek Publishing. You do not have to find a publishing house that is willing to let you publish your book. Anyone can publish a book for free with Sweek Publishing. There is no minimum order quantity so you can even print just one copy if you prefer. You can also use our platform to publish a photo book, a yearbook, or even a book about your family heritage. We work on a print-on-demand basis so the printing occurs only after the book has been ordered. But don’t worry, this does not slow down the delivery process as we aim to get the book to the reader as soon as possible! For each copy that you sell, you earn a good profit as well. You can sell via the Sweek webshop, but also via Amazon, Flipcard, iBookstore and more! So there’s really nothing to lose, just a new adventure to embark on! To start with, you have to create your own account on Sweek Publishing. After you have created your own account, follow these 7 simple steps and your book is ready to publish! After writing your book, you can choose whether you want to publish it as a paperback or as an e-book. Of course, you can choose to publish both, a print book and an e-book. If you have completed the process once, you simply have to copy it and change step 1 alone. Add the title and subtitle of the book along with some information about yourself. At this point, you can also fill in other specifications such as the size, cover finish (matte or glossy), paper (cream paper or white paper), and the interior colour (B&W or colour). The next step is to obtain an ISBN. You can skip this step if you want to sell your book on the Sweek webshop or on your own website. However, if you want to sell your book on other sales channels (Amazon, Kindle, iBooks, etc) this step is mandatory. With Sweek, you can obtain an ISBN for 12.75 euros and we’ll do the registration for you. In some countries, obtaining an ISBN is free and in others, you have to pay a small amount to obtain the ISBN. If you can’t decide whether you want an ISBN or not, you can also continue without ISBN and come back to this step later on! It’s time to upload your manuscript. You can upload it in .doc, .docx, or .pdf format. Check the book thoroughly before you upload it in order to avoid any mishaps during the publishing process. Check out this blog post for some tips on how you can proofread your book before publishing. After you have uploaded the manuscript, you have to provide more details about your book. You can provide the subject, the category, some relevant keywords, and a short and long description for the book. This information helps buyers find your book easily on web shops and search engines. Let’s admit that we all judge a book by its cover! And that’s why we think that designing a book cover is the most exciting step in this entire process. 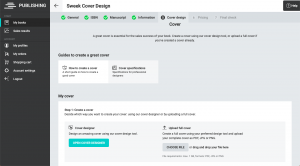 You can design the cover by yourself or use the cover designer provided by Sweek on the Cover Design page. Hold on, you are almost done! In this step, you get to determine the price of your book. Once you set the retail price, you can see how much profit you would make per copy sold. Set the right price for your audience, you don’t want to set it too low and not earn much profit or set it too high and scare buyers away. There are certain fixed costs (eg. shipping and printing costs) that come with publishing a book and this can affect your sales margin. Therefore, you can gain a higher profit by selling an e-book. You can also choose which sales channels you would like to sell your book on. What’s more, you don’t have to restrict selling your book to just your country – you can also select which countries you want to sell your book in. You’re only one step away from self-publishing your own book. In this final step, you can review all the information about your book. If you want to change something, you can go back to the relevant step. If you are satisfied with everything, tick the boxes and press the publish button. We told you, self-publishing is easier than it seems! Once you have published your book, spread the word to your family and friends so that they can buy your book. We also provide you with some promotion and marketing tools so feel free to use them to expand your audience! Good luck and don’t hesitate to contact us if there are any problems along the way! UPDATE: Hi Sweekers! By popular demand, we’ve decided to give you guys another month to finish your screenplays. We realize this is a new format for a lot of you, and that we’re asking for quite a long text compared to what most of you usually write. If you’ve already submitted your screenplay, feel free to edit it until the new deadline, i.e. the 25th of November! We’re thrilled to introduce the new Cine-Books Screenplay Contest! Hey Sweekers, we’ve got something really special planned for our next competition! Have you ever wanted to see your story visualized, and watch it play out in front of you – not just in your mind? If so, we think you’ll enjoy this new screenplay contest, which we’re running together with CINE-BOOKS.COM! Cine-Books specializes in creating Cine-Stories, which is a new type of home entertainment similar to photo-comics, but boasting cinematic quality. It is the budget-friendly alternative to series and films that allows for increasing readers’ exposure to your work and capturing the atmosphere and mood of your writing! We are looking for screenplays of up to 3,500 words that could be visualized in the Cine-Stories format. This means that your story will be told through digital photos with dialogue – much like a comic book. The winners will not only have their work made into a Cine-Book, but they’ll also receive free copies of their new visualized story to share with their readers. A fantastic gift for longtime fans and new ones alike. This is a great opportunity for you to tell your story in a unique and accessible format and expand your audience! Please make sure to read the guidelines on script-writing before you submit your story, as the entries that don’t adhere to these will be disqualified! Step 4: Publish your story with the tag #cinebooks either in the title, description or tags section (which is part of Story Details). That’s it, easy-peasy – you’re published! Don’t forget to share with your friends and family to get more fans! You can also promote your screenplay on Sweek or on the Facebook fan page. And of course, don’t forget to adorn your screenplay with a snazzy cover to attract even more readers. 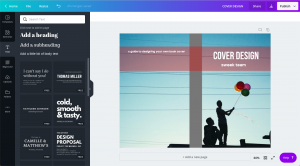 If you’re not sure how, or just need a guiding hand, you should check out our tips on how to create a great story cover. Only English-language screenplays will be accepted. You need to be over the age of 13 to participate. We are looking for screenplays of 3,500 or less words in contemporary fiction genres, where the story takes place in a realistic world (thriller, horror, romance, mystery, etc.) and is aimed at the young adult audience. Tag your story #cinebooks in the title, tag or description. Only stories submitted before November 25th 23:59 CET will be eligible for participation. Your screenplay cannot exceed 3,500 words. Your screenplay should conform to dramaturgical principles/standards with brief, clear sentences. Note that it will be visualized using high resolution pictures, so you have to follow the rules of script writing (see an example here How to write a Cine-Story script ). Only English-language short stories/screenplays will be accepted. The story doesn’t have to be exclusive. After the deadline, the jury will choose a shortlist of 10 finalists and announce them on the 8th of December.The Most Popular Screenplay Prize is determined by the number of likes given by the 7th of December 23:59 CEST. Falsification of likes and followers will lead to disqualification. Only the 10 finalists compete for this prize. Winners and finalists can use the official Cine-Books award winner logo, Cine-Books award user’s choice winner logo and Cine-Books award finalist logo to promote their writing. If the winner of the screenplay contest does not respond within a week, the prize will be given to the next participant. The submitted work must be created by you. The winners transfer the copyrights to CINE-BOOKS Entertainment for the production and distribution worldwide of various types of cine-book editions: photo-story, cinematic story, film. In case the winner is a minor, a written consent of one of the parents or other authorized legal representative to execution of the agreement and transfer of intellectual property rights to CINE-BOOKS is required. The writer will keep the rights to the TV or movie adaptations. Participation in the screenplay contest means that the user is aware of and accepts the contest rules. Head on over to Sweek to get started! The screenplays will be judged by the Cine-Books production team. The jury can choose 0 to 2 stories as winners. One winner will be chosen during the voting period by Sweek users. 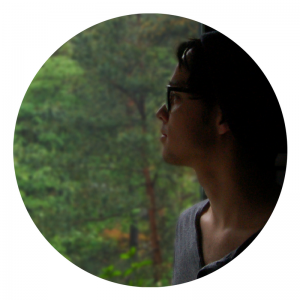 Sweek is a global platform for reading, writing and sharing stories. All over the world. For free. We are located in Rotterdam, the Netherlands, and have an international team from all over the world ? Step 4: Publish your work and fill in the tag #GoExplore in your Story Details (if you are using the website, do not forget to press Enter!). Finalize by ‘Publish’ – your story is now published and part of the writing contest! You need to add it to your Story Details (dont forget to press Enter on the website). Best way is to promote your story via your own social media and network. You can also promote it in Sweek fanpage https://www.facebook.com/groups/306066656501682/ or here https://sweek.com/#/read/45278/1400000162. You can find the link to share your story when you search for your story in the search bar and click on it. Here you’ll find the share button on the story info page! Current search is based on the title, description and the tag. So you can search for either of those. Step 4: Publish your work and fill in the tag #IndiaCollegeClash in your Story Details (if you are using the website, do not forget to press Enter!). 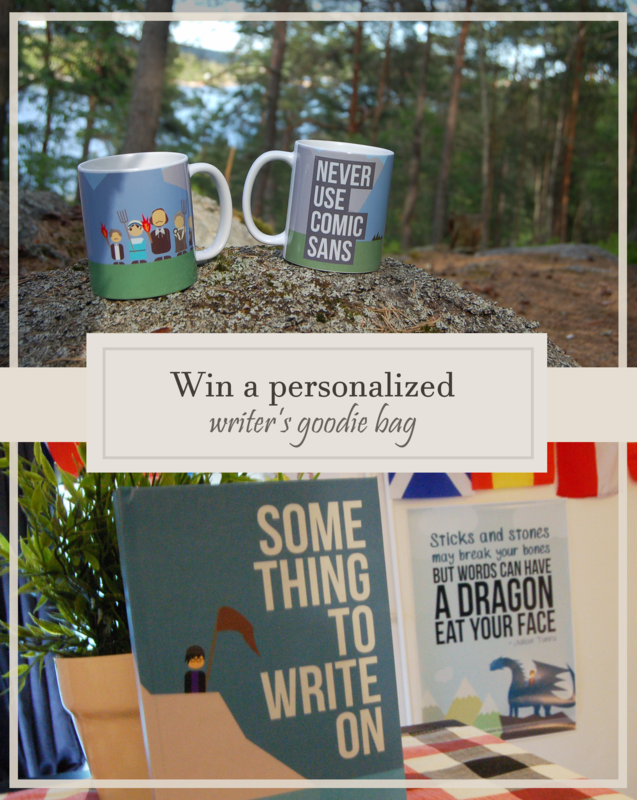 Finalize by ‘Publish’ – your story is now published and part of the writing contest! If you are an entry from an ambassador, put the tags specified by him/her. If you want your college to have a chance of winning the best college title, add the college abbreviation tag as well. Where can I find all the details of the contest (word limit, deadline etc.)? You need to add it to your Story Details (dont forget to press Enter on the website). You can either use #IndiaCollegeClash or just IndiaCollegeClash (both are fine). If you are an entry from an ambassador, put the exact tag specified by him/her. Best way is to promote your story via your own social media and network. You can also promote it in Sweek fanpage https://www.facebook.com/groups/306066656501682/ or here https://sweek.com/#/read/43452/1400000162. You can find the link to share your story when you search for your story in the search bar and click on it. Here you’ll find the share button on the story info page! Do you know how to put your adventures into words or have you always imagined yourself exploring the world? Write your #GoExplore story in less than 3,000 words and win a GoPro Hero camera to get your adventures on camera, or alternatively €150! Adventures make incredible tales – from Jules Verne’s classics to the modern travel stories we see today; they allow you to explore the world through the eyes of someone else. Adventures are exciting – whether they are about travelling, summer love, extreme sports, starting a new job, an unexpected turn of the day or something breathtaking in a fantasy world your protagonist lives in. The story can be any genre, as long as it is related to the topic. It can be a combination of e.g. young adult, romance, fantasy, science fiction, crime and it can have the form of both prose and poetry. Crowd prize is determined by the number of followers (all the allowed languages are participating). The deadline for the followers count is: 29/08/17, 23:59 CET. Falsification of followers will lead to a warning, followed by immediate disqualification if the behavior continues. We cannot wait to read about your adventures! #GoFeedback is open for all #GoExplore stories! Help your fellow writers get even better! The 2 best critiques will receive €20 each. How to join? Step 4. You can participate as many times as you like until August 29th. You can participate even if you didn’t write a story on the topic! Don’t hesitate to contact us via support@sweek.com for any questions! Dutch company Sweek is looking for young talented writers! Do you want to win cash prizes to cover a part of your tuition, take a weekend break from studying or treat your family to a great dinner? Start writing now and get a chance to win over ₹35,000 in cash in our student writing competiton! As long as your story is less than 3,000 words, you can write in any genre and on any topic: a thrilling mystery, a breathtaking fantasy, or an epic love story! HOW TO JOIN IN 5 STEPS? Step 1: You must be registered to a college in India. If you graduated any time in 2017, you can still participate ? Step 4: Go to ‘My stories’ and then click on ‘New story’. Create a chapter and write or copy in your story. Step 5: Publish your work and fill in the tag #IndiaCollegeClash in your story details. 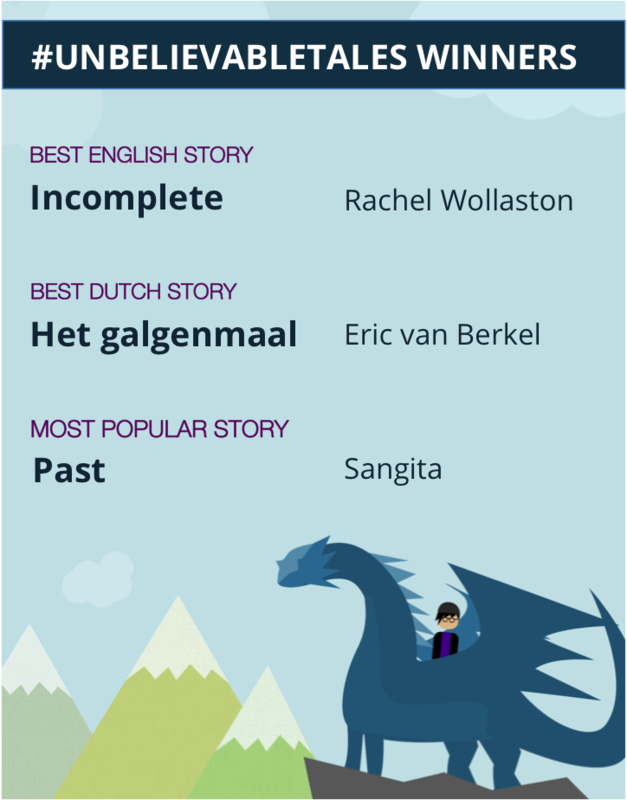 Finalize by ‘Publish’ – your story is now published and part of the writing contest! If you would like your college to win the best college award (so not mandatory! ), put the abbreviation of your college in the tags section, or write the university and college full name in the short description of your story. Good luck! For any questions, don’t hesitate to comment below or contact us via support@sweek.com. Sweek is based in the Netherlands, Europe. Your story will be read by these expert jury members and the Sweek editorial team. Pragya Sharma is a blogger, book reviewer, and clinical psychologist. Find out more via ReviewingShelf. Avnika Gupta is a Spoken Word Artist and street theater artist. 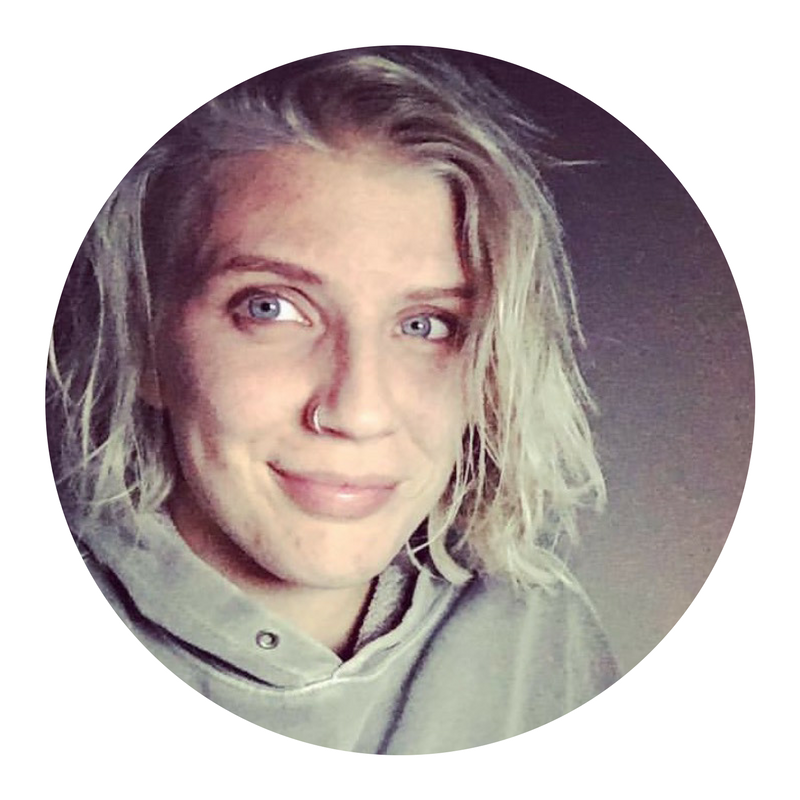 Check out her Facebook page! We’re sure you don’t want to miss the deadline, so join the Facebook event to get timely reminders! Literary Committee, LNMIIT. Visit them on Facebook! KalamKaar: the Literary Society of DDUC. Check them out on Facebook! Literary & Debating Club | NIT Calicut. Follow them on Facebook! University Debating & Literary Club – AMU. Read more on Facebook! Best college award goes to the college with the highest total score. The score is based on number of entries multiplied by the average score of the stories on a scale of 1 to 5, given by the jury. If the college has a literary club, they will be awarded the prize. If not, the college will be contacted. Most popular story award goes to the story with the highest number of followers. The deadline for the followers count is: 15/08/17, 23:59. Falsification of followers will lead to a warning, followed by immediate disqualification if the behavior continues. Best feedback award goes to person who gave the most useful feedback to a story that participates in the #IndiaCollegeClash competition. Simply add #IndiaCollegeClash to the end of your comment to have the jury read your comment. You don’t need to have written a story yourself to participate. The deadline for writing your comment is 15/08/17, 23:59. Best cover design award goes to the most beautiful and original cover. For participation you need to upload the cover on Instagram and add in description #indiacollegeclash and tag @sweekstories. 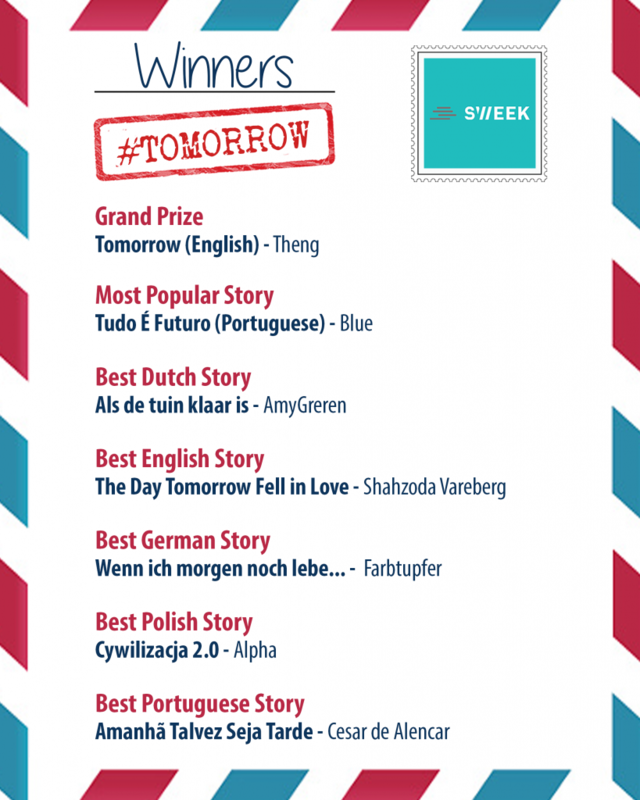 The winner will be selected by the Sweek team together with the Sweek Keepers. * The cash amount will be transferred via paypal or to a bank account with a valid IBAN and BIC code. The transfer fee will be paid by Sweek, but is not responsible for the conversion rate from Euro to a local currency the receiving bank uses. In case of non-availability of either, a gift card to a webshop can be considered. The printed certificates for the top 10 will be personalized and sent to their home address. The certificates for the college award will be sent to one address of the literary society or university and are not personalized. Dutch company Sweek is looking for young talented writers! Do you want to win cash prizes to cover a part of your tuition, take a weekend break from studying or treat your family to a great dinner? Start writing now and get a chance to win over ₹35,000 in cash in our student writing competition! As long as your story is less than 3,000 words, you can write in any genre and on any topic: a thrilling mystery, a breathtaking fantasy, or an epic love story! Upload your story on Sweek with the hashtag #IndiaCollegeClash and get a chance to win prizes below! Sweek is based in the Netherlands, Europe. Sweek and The Nearly Complete Guide to Writing Your Novel have partnered up for #UnbelievableTales writing contest! We invite you to write a story that will take our breath away – full of epic love, adventures, magical creatures, superheroes or mysteries. Are you up for a challenge and can you write unbelievable fiction in less than 1,000 words? Write your story in any genre, upload it on Sweek and have a chance of winning a personalized gift box with your face or character on it – uniquely designed just for you! The story can be any genre, as long as it is related to the topic. It can be a combination of e.g. young adult, romance, fantasy, science fiction and crime. Get microfiction writing advice from the Sweek team here or learn good writing practices from The Nearly Complete Guide to Writing Your Novel. Announcing the winners of the #Sweeklove contest!